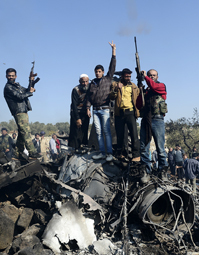 Will the Syrian civil war lead to a wider regional conflict? As civil war rages in Syria, the international community appears unable to figure out how best to help halt the bloodshed and prevent the conflict from spreading to neighboring countries. Also in the region, governments are dealing with escalating sectarian violence and — in post-Arab Spring Egypt and Tunisia — constitutional struggles among militant Islamists, political reactionaries and those seeking democratic reform. In Africa, the French military recently helped Mali push al Qaeda-affiliated Islamists out of the country’s northern deserts; and in Asia, North Korea has fueled regional tensions by escalating its nuclear arms program. The European Union continues to try to restore growth, create jobs and stabilize the euro. And new leaders have taken the reins in Russia, China and Venezuela. Syria’s worsening civil war has become the most violent manifestation of the democracy movements unleashed by the 2011 Arab Spring, which has spurred fierce power struggles among Islamists, old-guard reactionaries and pro-democracy advocates. The Syrian conflict is spilling over into neighboring countries as the big powers — Russia, China, the United States and the European Union (EU) — haggle over how to respond. Syria’s closest ally, Iran, is another worry, because of concerted international efforts to prevent it from acquiring nuclear weapons.